In disbelief I saw a stack of washers, telling me that the bolt head would not bottom out so the mechanic added washers until he thought it would tighten down. o.o lulwut, they should be on the hook for this and any subsequent damage it caused. even though the bolt did not want to go any farther into the hole / nut / uni-body, the washer were still loose. This tells confirmed that the noises I had been hearing had for sure been the motor mount moving! I am even more happy if I can install the correct bolts myself to ensure the repair is done correctly. novice question: will an engine crane be needed to do this work? or can this be done with everything in chassis? 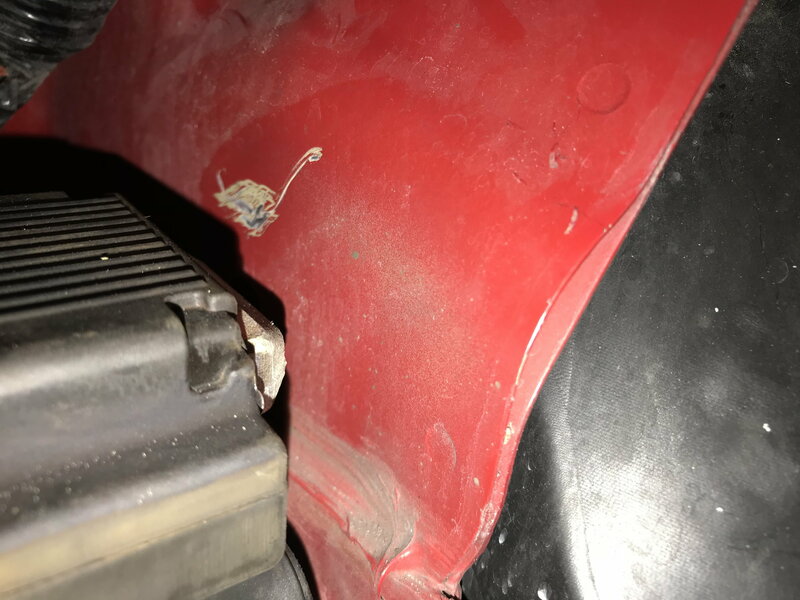 i ask because my 2017 fit was one of the mexico plant fits, and that seems to be where the original failing in QC has been brewing around the net, and i don't trust the dealership i bought the car from- nor do i know of a "good" mechanic in my area. Hey knope - A crane or hoist is not needed, but a long extension makes life much easier. The engine is resting or suspended on the uni-body frame rail so it can't go down. But, make sure the car is on flat ground and there is no load on the drivetrain from being in park with an automatic, or in gear with a manual. This will guarantee you that everything is relaxed. You remove the battery and the battery tray just lifts out. Then you can see the front bolt. As for the back bole, it's a little more difficult. 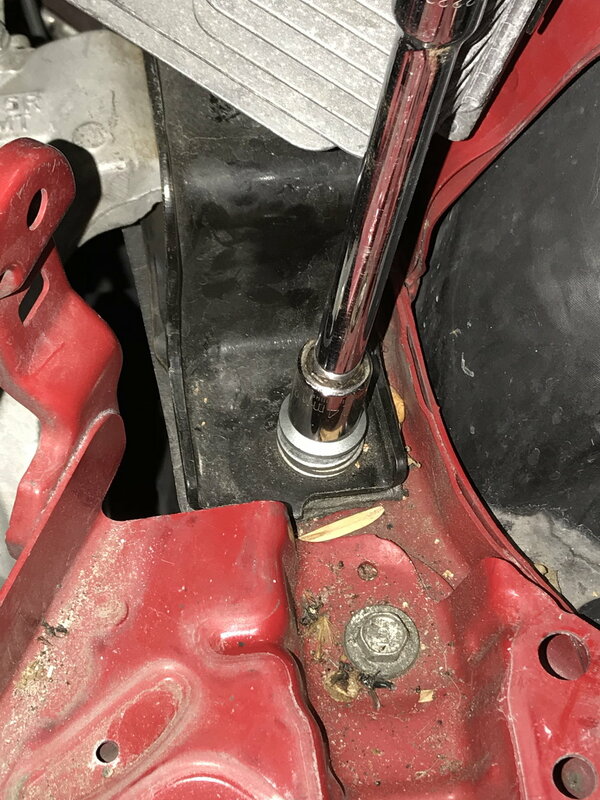 You will see two bolts that are holding a bracket, which is holding plenty of stuff just above the other bolt head you need to access. I still haven't had time to swap out my bolts or diagnose further. I'll order the bolts right now and maybe I'll have them over the Thanksgiving break. 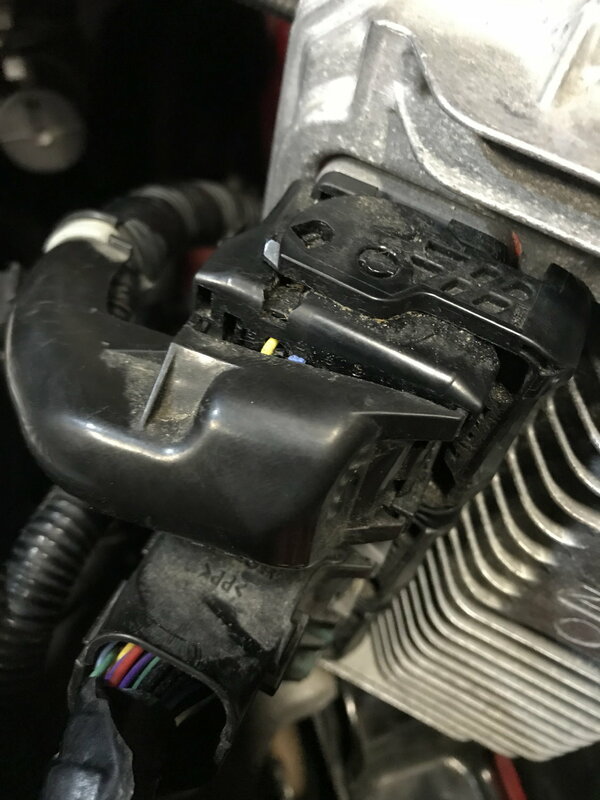 The guys who mess around under the hood all the time, this would be a 20 minute fix if they where methodical and careful with their tools and wiring. I can't stand flexing wires and stuff so I go super slow. I'll plan for an hour from hood up to hood down, plus a beer break in that time. 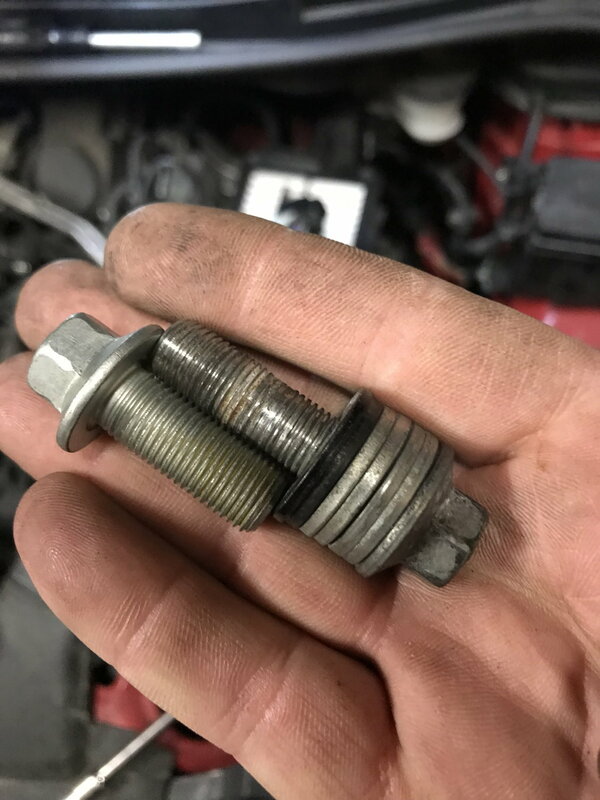 If you don't like reading into this... the summary of what you will read below is, just keep tightening your engine mount bolts and the noise will go away. I'm hopeful you only have to tighten them one time. FINALLY - I was able to spend a few hours and meticulously investigate and diagnose my noise issue. 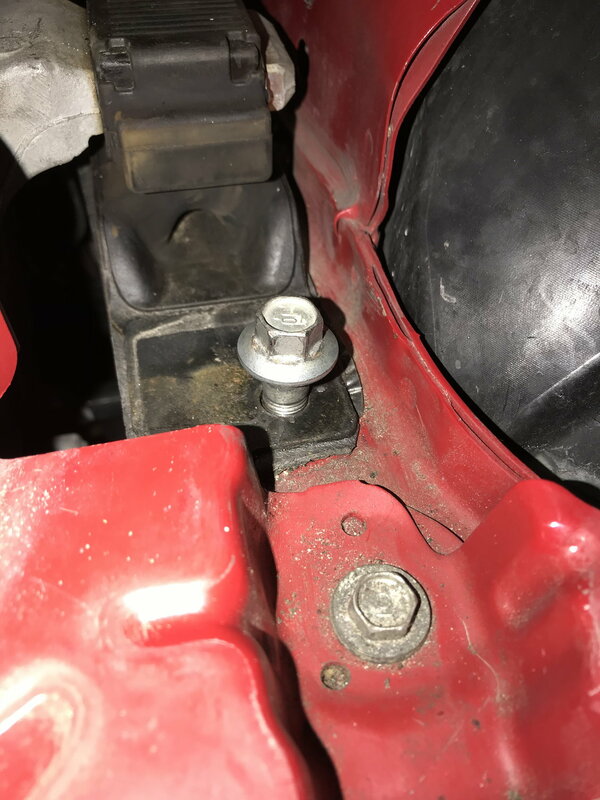 If you read my previous posts you will see that I have updated them and I no longer believe the bolts were bottoming out in the bottom of the holes or on the shoulder of the bolt. I do believe I was safe to think the way I did after a series of events that included stacks of washers installed by the dealership during a warranty repair. I previously thought 30mm bolts would be the answer. I no longer feel this way and the OEM 45mm bolts should be just fine, assuming the threads have not been damaged. I am about to make a 2500 mile round trip to Florida so fixing my noise became a priority last night. This picture shows how much thread is engaged with the 45mm bolts. This is with the threads of the bolt sitting on the female threads. Obviously those annoying 'dealer installed' washers are still in the picture. Basically stating that there is A LOT of thread engagement. So here is where things really took a turn for the worst... My three year love affair with this car may have ended right here. It appears the reckless so-called mechanic that touched my car at the dealer, and installed these wonderful stacks of washers (sarcasm), he must have been terrible with his tools too... This harness connector was disconnected and lifted up for this picture, nothing else was done for this picture. That little electrical tape was exactly as you see it. Exposed copper wire will also be shown in a later picture. This is without doing anymore than disconnecting the socket connector. 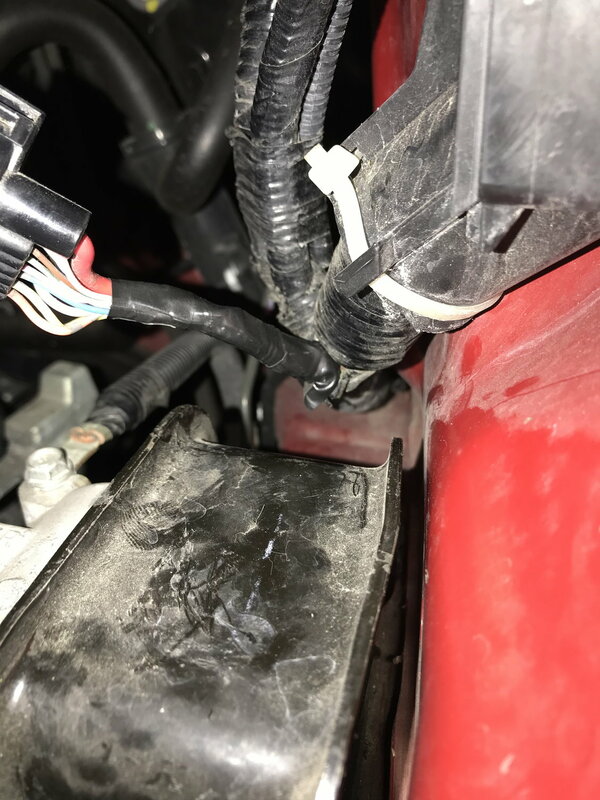 Picture I took as I noticed a little damage and stood there shocked as I noticed no wire loom and a terrible electrical tape job. Giving this a much closer inspection since it appears this harness has been spun around a power tool and likely had the loom ripped off of it. Notice the open wires showing. I put a band-aid on this for now and I guess I'll sadly ignore it until this is handled with Honda. The following picture is the temporary fix. I previously said that I felt 30mm bolts had to be the answer and it turns out I was wrong. The 45mm should be just fine. My bolts had been damaged from months of this ticking/creaking sound and who knows how much damage was done by the mechanic. I can tell he struggled with this job by looking at the pry bar marks on my car where he tried to align the engine mount holes. A professional would simply lay a rag there before repeated prying on the mount. Here is a picture of the rear bolt being held next to my new 30mm bolts. You can see why I thought 30mm must be the fix. 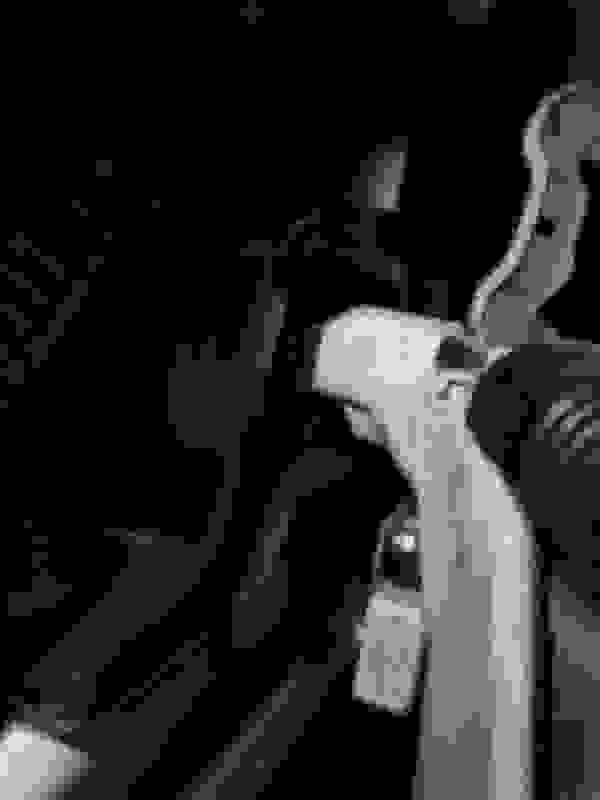 The silver washers were installed by the Honda mechanic. The black washers were installed by me in an early quick fix since the bolt was getting too tight to force it in. A better summary... it took more washer to fill the gap and get the washer to stop spinning on the bolt. Oddly half way up the threads there is a sealant and just past that is thread damage. I'm speechless over this entire situation. Also I was curious how far in the OEM 45mm bolt would go before getting uncomfortably tight. I'm wondering if the factory female threads are protruding and designed to work like a lock nut? Anyway, here is a picture of the bolt installed about as far as I was comfortable. This explains the use of washers. I know I'm still recommending the 45mm bolts the OEM uses, even though this looks like this. There is nothing below the female threads so the bolts should work. Maybe there is paint, primer, or maybe they are protruding head nuts that are supposed to act as lock nuts. Too many assumptions. I believe the 30mm bolts are long enough for right now. Because I had them and because the 45mm are for sure damaged, I will use the 30mm bolts until I know more about a future fix. 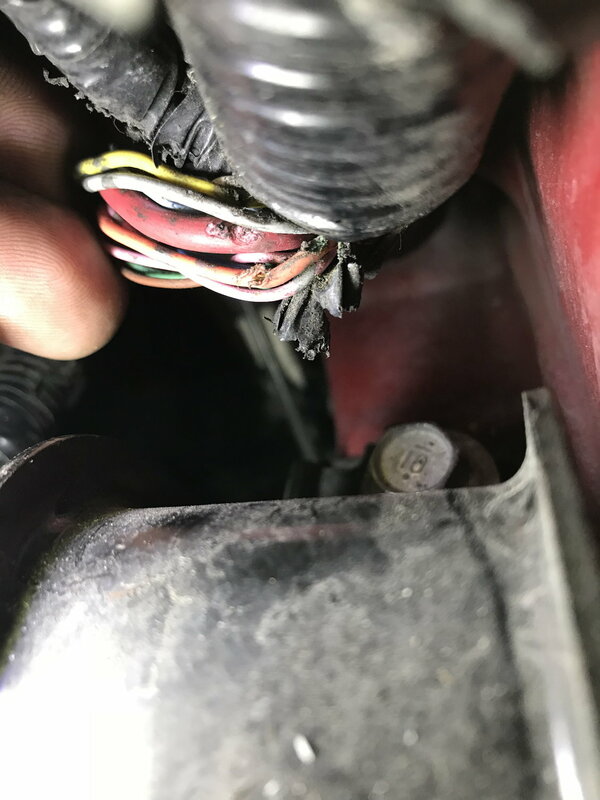 While putting the car back together I was bummed to see that quality control also couldn't install the wire protection correctly so I repaired this too.. These go together like Lego's and there should not be wire showing. They fit so tightly that there is no way this was caused by me or the so-called Honda mechanic. Just fuel on the fire as I feel let down. Once again, no noises because the bolts are tight. The car is a pleasure to drive. 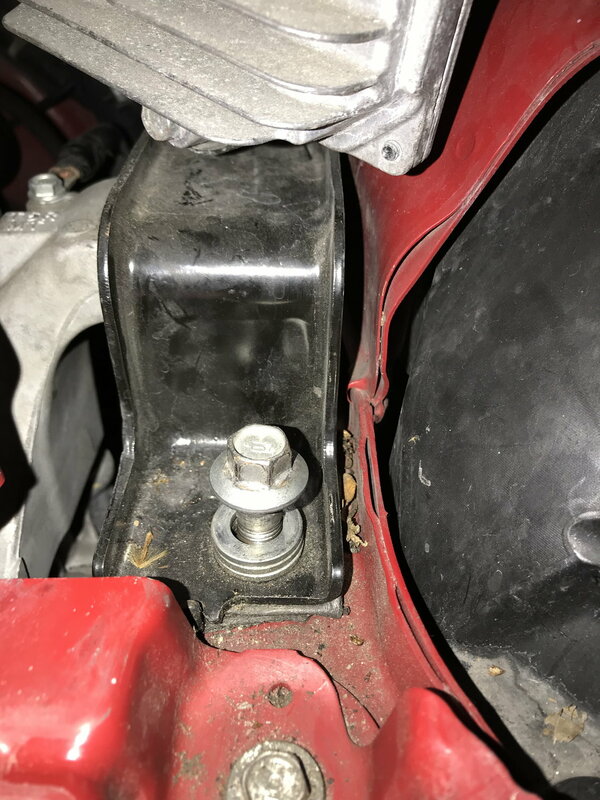 I'm mad at a mechanic and can't blame Honda too much, but the mount being loose and coming loose is ridiculous. 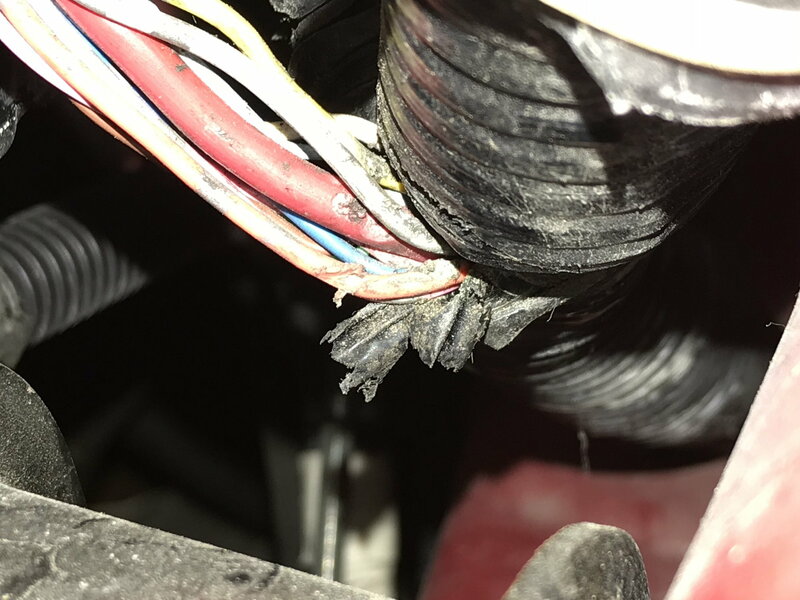 At this time, because of the wiring issue, I will likely ask that a professional mechanic replaces the wiring harness and installs the correct 45mm bolts, or Honda sends me out the door with the same car payment in a brand new, identical car. I've always had the dream of seeing how long I could make a brand new car last... Honda mechanics are making it hard on me to fulfill my dream. Not happy with my dealer either but all they did was leave my splash shield hanging after an oil change....nothing compared to this. Looking at your pictures, did they put some kind of gasket material under your mount? Do you think you'd be getting these temporary quiet spells if it was still metal on metal? Yes, it's a sticky sided foam-like material. This was from the dealers first and only attempt at quieting the issue. We were mimicking the some of the original posts regarding material. Also installed at the same time as the infamous washers... I'll probably wish I didn't say this, but I think with the washers removed, I should be in good shape. I don't think the material has much to do with the situation now. I believe the tall stack of washers was the culprit following the mount simply being loose. I have the same problem (2015 EX 6 speed). It was the first thing fixed after a couple of months using the car. It's been almost 3 years now and the creaking sound on 1st gear is back. 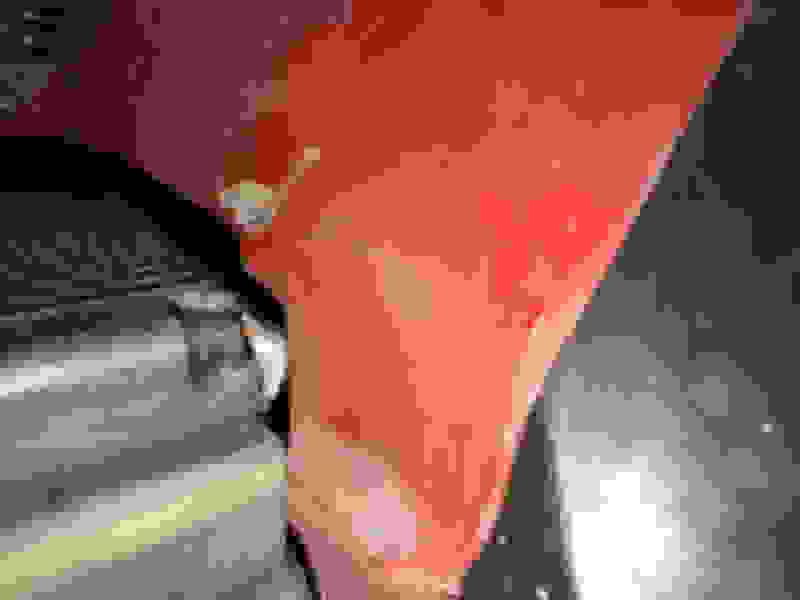 My warranty is about to expire and I doubt that the dealership will be able to provide a permanent fix. Might have to do this my self. If this is in response to bertosfit post earlier, he didn't describe it as "clicking," he described it as "shuddering...." could be the result of not being high enough in the revs to shift to second, lugging the engine, or the strange "hesitation" at 2200 rpm, especially in second, that is not uncommon, when shifting to second and being below that after the shift. This post could indeed be his problem, but....I wouldn't possibly call a click and a shudder the same thing. it is. I didnt bother reading too much into the post. My bad, fellas! These two were next to each other on my old subscribed threads and I grabbed the wrong one, before going back and editing my post. 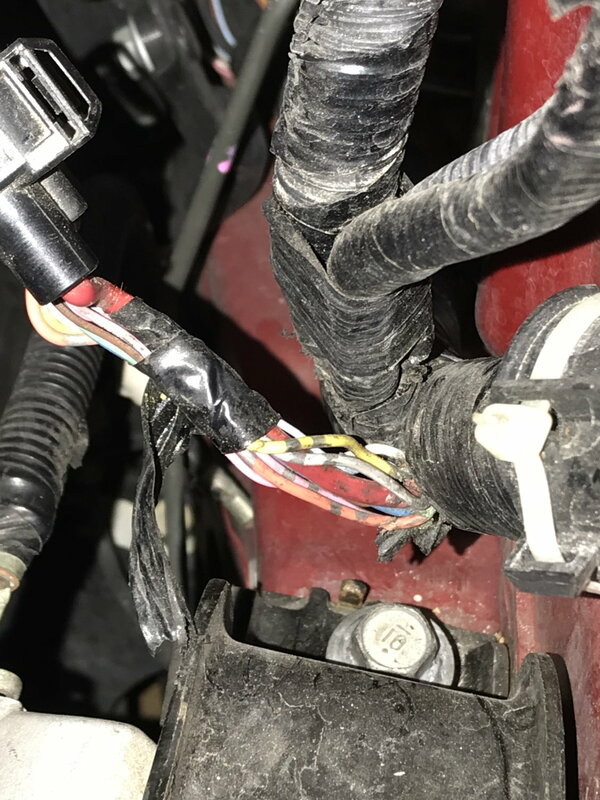 Such a crappy deal about the mangled wiring harness. I’m new to the Fit world but have always been a car and motorsports guy. i recently bought a 2018 Fit Sport 6MT with 15k on it. Anyway today I did an oil and filter change on it, HAMP filter and Mobil 1 0W-20. Sorry old guy, back on track here. I have noticed my car will make that freak or slight clunk when taking off and occasionally I hear it in second. So under the car I was looking at the trans mount. 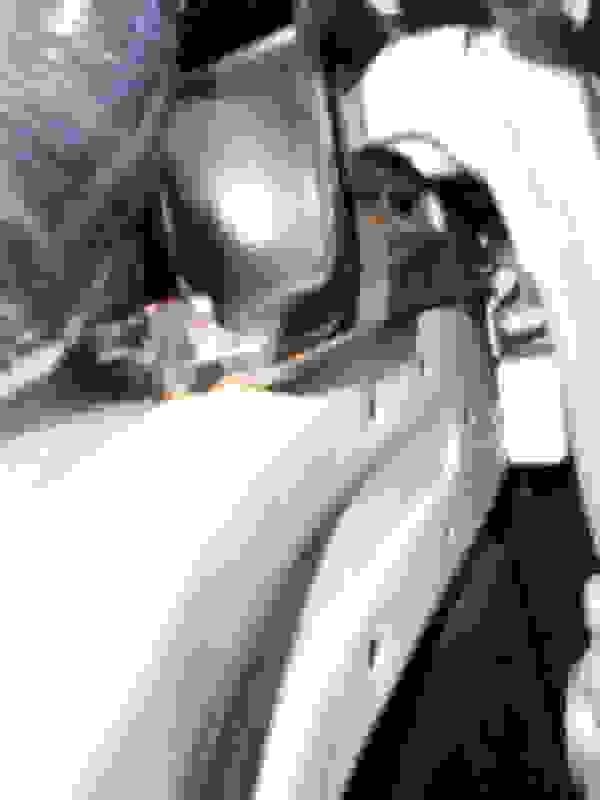 While there I noticed there is a kind of heat shield that wraps around the left side (driver) axle. This shield uses what looks like a stainless mesh washer on both sides of the mounting tabs. What is really odd is that the shield is not held tightly in place. Bolts are tight but if you just grab it you can clank the thing back and forth. it makes a clunking sound when moving it around and I can see from the fret marks on the shield that it indeed has been flopping around. The mounting point above it does the same thing. Just seems odd that they would allow this piece to float when there doesn’t appear to be a need for it? Anyway that’s my $.02 on this matter. While I was at it I was also wondering why Honda would use self tapping screws to hold that splash guard in place? Most cars I’ve had used those push pins and a real fastener.